Many of our students and customers sell their beadwork and jewelry at craft shows. They all ask whether to accept credit cards, and if so, how. You definitely make more money by accepting credit cards at craft shows. If you can’t do this right away, it’s something to keep at the top of your list. The business problems are obvious — credit card processing costs you money, there are monthly recurring costs whether you are selling things or not, and your business might be low volume — at least when you start out. Today there are many relatively low cost options for the single entrepreneur who is just getting started. The least expensive way to do this, particularly when you are just getting started, is to piggy-back onto one of your friends’ or relatives’ credit card accounts and systems. If you know someone who has a business that accepts credit cards, perhaps they will be willing to let your run the card numbers on their terminals. If they have a wireless terminal or account, then you can bring this capability with you to your show. If they do not have such a set-up, then, what you would do at the craft show, is write down the customer’s credit card number, expiration date, security code, billing address, and phone number, with the sales $ amount. You would tell the customer, because of expense, you will need to run the credit card number after the show when you are near a credit card terminal. Occasionally a customer might be shy to do this, but not usually. Preferrably none. They might waive this. If there is a set-up fee, always ask if they will waive these fee. Often they do. Some banks will charge you an extra fee for accessing their bank to run their credit card, where you do not have an account there. You see this alot when running Debit cards. The credit card processor also bills you monthly, and perhaps again semi-annually, for the charges banks charge them. Sometimes you can waive this, if you agree to some kind of contract. Some credit card processors charge you a minimum monthly discount rate, whether you’ve run credit card transactions or not. This would not be good for you, if you were only doing the occasional craft fair. Some credit card processors might set a dollar limit per transaction or a dollar limit on total transactions per month. Be sure these limits fit with your business. 11) Minimum contract time periods. Ideally, you would not want to lock yourself in for any time period. Locking in for 6 months would be reasonable. Locking in for 3 years excessive, unless the rates offered are especially attractive. Ideally, you want no cancellation fees. However, these are common and can be expensive. Different credit card processing companies make their money in different ways. Some of their fees will seem very low, and others very high. You need to figure out a way to compare across companies. Here you would try to figure out what a $100.00 sale, each month for 6 months, (so a total of $600.00), would cost you, given each option. e) You might access an 800# through your cell phone. (This would be your lowest cost option, and might only run between $5.00 and $30.00/month, after your initial fees when you open the account). Some processors will have special seasonal plans, such as if you only do business November and December of each year. Find out how quickly funds are deposited back into your bank account. Be sure you can take at least Visa and MasterCard. American Express is a little more expensive, but many people use their card. I have had many bad experiences taking the Discover Card in my business, so it is not a card I accept any more, or recommend. Be sure that your customers will see your business name next to their charges on their monthly credit card statements. There is an attachment to your cell phone — a card swiper — which can be purchased that will allow you to scan a credit card, instead of punching in the numbers into your phone. Using this attachment will lower your “discount rate”. It will also let you run Debit cards as Debit cards, which is considerably less expensive than running Debit cards as Credit cards. These attachments cost between $70-100.00. If you want to provide your customer with a receipt, there are mobile printing terminals that can hook up to your phone or laptop. At craft shows, I usually give the customer a written receipt on one of my invoice forms, and don’t both with the credit card receipt. You can set up a merchant account through PayPal. You would probably want to use their Virtual Terminal. You can access that terminal with any wireless device — laptop, cell phone, and the like. Verizon, AT&T, Sprint and other cell phone providers have credit card processing plans that you can take advantage of. They are basically playing a role of “reseller” of a real credit card processor. For example, Verizon will set you up with Chase Bank. You can find wireless credit card processing companies online, and see what their terms are. The Griffin bead cord, both nylon and silk, comes with a needle attached to the end of the cord. This makes it easier to string. It also makes it easier, when knotting, to use a thicker cord and get a larger knot. However, many bead cord products come on spools and do not have needles attached. What do you do in this case? First, there are needles that work in this situation. There are two kinds of needles to use with bead cord, and you would probably want to have both on hand. The first is called a Big Eye Needle. You wedge the end of the cord at one end of the needle, and that becomes your trailing end. The other is called a Twist Wire Needle (also known as a Collapsible Eye Needle). A medium size in this needle would probably work fine. Both needles have short life-spans, so you would need to have a bunch on hand at any one time. Another thing people do with the nylon bead cord is either use superglue on one end, or take a bic lighter to one end to melt it. This makes the end stiff. Then you take a razor blade and cut the very end at an angle, so you have a “needle” at the end of the cord. There’s been an explosion of available metal colors out there in jewelry findings, chains and other components. Copper and Antique Copper, Brass and Antique Brass, Antique Silver, Steel, Platinum, Pewter, Antique Gold, Bronze and Dark Bronze, Rose Gold, Gunmetal, Metallic Cobalt, and many more. When you are making a bracelet or necklace, however, you might not be able to find the metallic colors you want in the pieces you want to use. Did you know you can take any metal or plated metal part and paint the color finish you want on it, using a special metal-based paint? Recently I have been experimenting with some relatively new products, the main one of which is called a Metallic Surfacer. These Metallic Surfacers come in a dozen or so metal colors. The paint is made up of metal turned into a powder and suspended in a paint solution. When it dries, the surface is metallic. The brand name is Sophisticated Finishes by Triangle Coatings. These are available at Michael’s Craft Stores, as well as from several sites on-line. To use these, what you are painting must be metal or plated metal. If the pieces are clean, you can paint right onto them. If not, you can prime the surface with a Sealer/Primer that is also part of this line. You would typically put two coats of Metallic Surfacer on. Let each coat dry about 20 minutes. To add some aging, you would paint on a darker metallic surfacer color, or one ofthe tints, antiquing solutions or patinas. You brush this on, and wipe it off with a soft cloth. You are trying to wipe off the highest points on the piece so that they stay shiny, but not the deeper crevases, which you want to see some of this coloration effect. You may want to do this 1-3 times until you get the look you want. Let dry. Paint on 2 coats of Sealer/Primer. This secures the surfacer from any abrasion, and brings back a more metallic looking shine. These coats take about 30 or so minutes to dry. 2. Get Krylon Metallic Paint in a light color, like an Almond Color and a dark color, like a Very Dark Bronze. Put your piece on the ground in an area you don’t mind getting some paint on. Do a short spray of the light color into the air about 4-6 feet from your piece, but in the direction of your piece, so that some droplets will fall on it. Do a short spray of the darker color into the air about 4-6 feet from your piece, but in the direction of your piece, so that some droplets will fall on it. Old pieces are pitted. This makes them look pitted. Dark drops will fall partially over light drops, and this gives dimensionality and shadow to your faux pitted look. 3. Use a tint or patina. Brush it on, and wipe it off. You may want to do this 1-3 times until you get the look you want. 4. Paint on the Sealer. One coat may be sufficient. Two coats may start to make the piece look too shiny and new again. But today, you need to compete with lots of online sites that offer free instructions, streaming video on demand, and lots of low- to -no-cost how to videos. Until now, you were probably shielded from the full impacts of these new alternatives on your teaching business, because they were somewhat hard to find or access. Or somehow inconvenient to get to. Or their production values — quality of images, close-ups, lighting, and the like — were low. But no more. 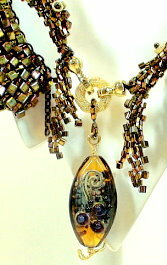 Bead & Button, BeadStyle and Art Jewelry have put up a new downloadable video site called Jewelry Classes on Demand. A typical class is $12.95 to $19.95. I’ve reviewed about 20 of these, and most are very good. What B&B can do that other sites on line which also offer free to minimal-charges videos cannot, is bring a lot of professional filming value to their videos. Good lighting. Lots of editing and close-up shots. Well known instructors with a lot of name recognition. Almost as good as being there in person. And B&B, BeadStyle and Art Jewelry are so familiar to so many beaders and jewelry makers, most students we end up teaching will easily find out and be aware of these video classes. These magazines will keep their Jewelry Classes on Demand in everyone’s face all the time, at every opportunity. They stand to make a lot of money from these. In order to stay competitive, we each need to think about the classes we teach, and what “value added” components we provide in our classes, that someone could not get online for $12.95, and from a downloadable video. In your classes, you also need to talk about these value added components that you provide. This builds expectations about our classes — especially in relationship to this online classes. This builds word of mouth. It builds loyalty. With the weakened economy, this becomes more crucial. Everyday, in my store, I see students now avoiding the expensive workshops; signing up for 1 class at a time, where typically they would sign up for 2 or 3; buying a book instead of taking a class. Compare your typical instructional fee – $30.oo to $40.00 – to the $12.95 – $19.95 of these videos on demand. What more does the student get for $30.00 – $40.00, and does the student recognize this? How does the student recognize this? Things to think about as you fine-tune your current classes, and think about offering new ones. These days, I find myself using FireLine for most of my bead weaving and bead stringing projects. FireLine is what is called a “cable thread”. Cable threads are threads braided together and encased in nylon. It’s very strong. It’s easy to use. It keeps a tighter tension on the beads than Nymo or C-Lon beading thread. Beading thread is flat and shaped like a ribbon. Beading needles have rectangular holes. FireLine, however, is shaped round. To make it easier to thread FireLine into a beading needle, you can flatten the end of the FireLine. I pull the end between two of my fingernails. You can also use a chain nose pliers to flatten the end. Then pop it into your needle. You don’t necessarily have to wax the FireLine, but a lot of people like to do this. If you wax it, this will increase your thread tension considerably. In most projects a tight tension is very desirable. Position the crimp and the wires, so you leave an adequate “loop” (joint). The clasp should be able to move freely. You never push the crimp bead all the way up to the clasp. When crimp/wire/clasp are too tight, and can’t move, then you basically have metal bending back and forth against itself as the jewelry moves when worn, and it breaks. When using a horseshoe wire protector, this forces you to leave the appropriate sized “loop”. You need to leave about a 3-4” tail on each side of your piece. While you are crimping, you want to hold the tail so that it runs parallel to the spine. When you crimp, don’t let go of the tail. If you let go, the tail will either bend over far to one side, creating a “V” with it and the spine. Or, it will cross over the spine. Many people, when they push down on the pliers to squeeze the crimp, they inadvertantly let go of the tail. When you let go, the tail wire will either cross over the spine, or stick out too far to one side. When this happens, your crimp won’t hold. So, to repeat, you hold the tail parallel to the spine. It doesn’t have to touch the spine, just follow the same direction. When you squeeze the pliers closed over the crimp, you let go of the pliers to release the crimp, but you don’t want to let go of the tail. When stringing your beads on, you want to get at least your first bead, and preferrable several beads, on over both the spine and the tail. When you finish off your necklace or bracelet, you want to feed your tail back through at least the last bead, and preferrable several beads. You then pull the tail out and cut it off as close to the hole as possible. 2) you want your ends to be as secure as possible, and make it as difficult as possible for any wire to pull back through the crimp. The top part of the pliers is called the jaws. Look closely at the jaws. You will see that both sides of the crimping pliers has two notches. The bottom notch on both sides consists of a “ditch” on one side, and “ditch with a pyramid” on the other. You should be able to see the “pyramid”. This is critical to the crimping process. Sometimes when you buy a new crimping pliers, the pyramid is missing. Othertimes, when you’ve used these awhile, the pyramid wears away. The top notch on both sides consists of a “ditch” on both sides. There are many variations on the crimping pliers. I have found that only the original, basic crimping pliers works as it is supposed. The Micro Crimping pliers for smaller crimps doesn’t really work. The regular crimping pliers works better here. The Macro Crimping pliers for larger crimps doesn’t really work. The regular crimping pliers works better here. The Magical Crimping pliers to make perfectly re-rounded crimps, does make some beautifully re-rounded crimps, but it weakens the hold in the process. Plus, it screws up even more with cable wires that are not .019″ thick. Your Crimping Pliers has two sets of notches. Steps 1 and 2 are done with the bottom pair of notches — those closest to your hand (ditch on one side of the jaws, and a ditch with a pyramid on the other). Steps 3 and 4 are done with the top pair of notches — those furthest from your hand (ditches on either side of the jaws). Step 1: Crush onto wire: A firm full squeeze on the pliers and then let go. Let go of the pliers. Keep holding the tail parallel to the spine. Step 2: Turn over 180 degrees, and crush again. We do this because in Step 1, the side of the crimp bead closest to your hand pushes down, but the opposite side, furthest from your hand, actually flares out a little bit. We want to push this flared part down. You end up with a flat pancake. On one side of this pancake, you’ll see a scoring line created by the pyramid. line. A firm full squeeze on the pliers, and let go. Again, keep control of your tail. You now have half a flat pancake. Step 4: Use the top notches to gently force the flat crimp back into a round shape again. If you look at either end of the crimp, you’ll see a circle again, rather than a rectangular slit. You want to reshape this half a flat pancake, so that it looks like a tube or round bead again. Manytimes, your crimp bead will be longer than the width of the jaws on your crimping pliers. So, you will have to work both ends of the crimp independently, in order to re-round them. Look from the loop side, and look from the tail side. If you see a round circle opening on each side, you’re done. Instead of Step 4, you can use a crimp cover, and slide this over the crushed crimp to hide it, instead of re-rounding it. You can always make your crimp beads the second and next to last beads, instead of the first and last. In this case, the crimp will look like it is part of a pattern. The crushed crimp won’t look so out of place, or unfinished. When the crimping fails, most people either blame themselves, or they blame their pliers. However, in most cases, the blame is squarely with the crimp bead. With crimp beads, you get what you pay for. Cheap crimps, like the ones you buy in packages at craft stores, like Michaels or Hobby Lobby, are not manufactured well. When you crush them with your pliers, the seam splits. Sometimes, you can actually see the split seam; oftentimes, you cannot, at least at first. As the seam splits, the wires can work themselves out of the crimp, or the crushed crimp can more easily cut through your stringing material. Quality crimps can be crushed and worked about 8 more times with your pliers, before you have to worry about the seam splitting. Heavy duty crimps can be crushed and worked over and over again, without worry. If you feel you are scratching up your pieces with your pliers, you can do one of two things. You can replace your pliers with nylon tipped ones. This solves the scratching issues, but sometimes you don’t feel you have the same control over these, as you do with regular pliers. Or, you can take some duct tape, and tape over the jaws of your pliers. You can do this to your chain nose pliers, flat nose pliers, round nose pliers, and the like. Since the duct tape is thin, you don’t lose that “feel”, as you manipulate the pliers with your hand. If you want to determine if a bead is glass or plastic, click it on your front teeth. If it’s glass, the click sound will be sharp. If it’s plastic, the click sound will be dull, more thud-like. CLEVER MARKETING #1One of my students owns a jewelry and gift store. She also sells the works of many local jewelry artists on consignment. One very effective marketing strategy she employed, was to give a piece of her jewelry to every female employee that worked in the bank closest to her store. In addition, she told each employee that they could have a 10% discount on anything in the shop — just tell whoever’s working that they work at this particular bank. Boy, did she get customers from that. Female customers of the bank saw the bank tellers wearing the jewelry, and asked where they got it. And the bank employees were very happy and very motivated to tell them. (1) Always experiment with your adhesives first, before you use an adhesive on your final project. No one glue works with every project. My favorite glue is referred to as a 1-part epoxy (but it’s not really an epoxy). “1-part” means that you don’t have to mix anything to make the glue – it just comes out of a tube. One brand is called E6000, and this version of the glue is thick in consistency. Another version of the glue is called Bond527. This glue is runny. Some people prefer one or the other. E6000 is the first one I used, and I prefer that one. Perfect for attaching findings to base metal and costume jewelry pieces. Also, use E-6000 on bead strands to seal end knots and to provide a strong, flexible seal that won’t become brittle or damage the bead cord. E-6000 is safe for use with virtually every type of gemstone and works on wood, leather, vinyl, and canvas. Non-corrosive and self-leveling, E-6000 adheres in 5 to 10 minutes, and hardens to a clear, waterproof cure in 24 hours. This means you have about 10 minutes to position and reposition whatever you are gluing. After about 20 minutes, you can take your finger and rub off any glue that has oozed out from any edges or around any pieces. If you are making jewelry, you should let the piece dry “hard” overnight, before you wear it. E-6000 dries like rubber, so the glue acts like a shock absorber, as your jewelry moves. One drawback: it doesn’t bond well between two smooth pieces of glass. When we use E6000 with rhinestones, we put a little drop of glue on the end of a pin. Then we touch the glue to the back of the rhinestone. We maneuver the pin-glue-rhinestone over the place where we want the stone to be. Then we push the rhinestone in place, and simultaneously pull the pin away from the stone. We rub the stone and around the stone with our finger or the pin to get any excess glue off. Before it dries, E6000 rubs off like rubber cement. Superglue is not our favorite! It often ruins rhinestones (it discolors them and makes them cloudy) and other pieces we use in jewelry-making. It’s bond is tough, but it breaks easily. Superglue dries like glass, and the bond shatters like glass. Moreover, the shattered bond looks like a piece of broken glass, so if any stringing material is nearby, the bond can cut it. We do, however, use superglue occasionally. We prefer a stronger brand of this glue called G-S HypoCement or Watch Crystal Cement. We often use it to seal end knots, or coat a frayed strand of cord. We sometimes use it on crimp beads to enhance the closure. Hot glue guns are fun to use. When the materials you are using are large and bulky, hot glue guns make the projects go faster. The glue’s bond will not last forever. The glue will yellow with age. The bond weakens at body temperature. If you made a dangly pair of earrings, and hot-glued a rhinestone to the piece that touches the ear, the rhinestone will likely pop off when the earring is worn. If you hot-glued stuff on the dangle, you won’t have the same problem. – Take the thread in one hand, and the needle in the other. Push the needle onto the thread. Keep poking the thread with the needle until the thread meets the hole and slips through. Then pull on the thread. – Put the thread between your thumb and fore-finger, and pinch it. Pull it down between your fingers so that the end slips just below the top surface of your fingers. Place the needle over your fingers, lining up the eye hole just above the gap between your two fingers where the thread is hiding, and keep the needle from moving. Squeeze your thumb and forefinger together, so that the thread pops straight up and into the eye-hole. Voila! Magic. Then pull on the thread. When cutting your thread off the bobbin or spool, if you cut at a slight angle, it makes it easier to get the thread through the eye hole of the needle. What The Heck Is “Bali Silver”? From time to time certain styles of decoration and certain techniques of metal fabrication tend to get associated with the specific cultures or groups that created them. A long time ago, people of the Hindu faith were expelled from most of the islands of Indonesia and sent to the island of Bali, also a part of Indonesia. The Hindu people represented the artistic and intellectual classes at the time, and they brought with them rich craft and artistic traditions. Their master silversmiths created a very beautiful and what I would call an overly-decorative style to their pieces. They also frequently relied on their inventive technique in silver fabrication called granulation. They worked in sterling silver. They would take their finished pieces, and either oxidize them, which darkens or blackens the silver, or they would electroplate their pieces in bright karat golds. This is called “vermeil”. I like to think of Bali Silver as a style, because it has been widely copied and imitated, and all the copies and imitations are labeled Bali Silver, as well. In Bali itself, each piece is handmade. This is called fabrication. Jewelry design and Bead supply companies contract with different silversmiths on the island to come up with unusual designs and thus make their lines special and unique. If left to themselves, the local silversmiths can get sloppy in their work, so it’s important that these companies have some strict and consistent quality monitoring of the work. Without this quality control, the stones pop out of their settings and the decorative elements like granulation pop off as well. Many countries, most notably India and Turkey, have copied the Bali pieces. But instead of hand-making (fabricating) them, they cast them. In the casting, it’s amazing how well they can reproduce the intricate details. The casting also allows them to keep making the same piece over and over again, so you end up with many beads or findings that look exactly alike – same size, same detailing. No imperfections. This is not true with fabrication, which results in a lot of variability. In the casting process, a lot of silver is lost, so these pieces typically are not “sterling”, that is 92.5% silver, and usually aren’t labeled as such. And of course, anything cast cannot absorb the tremendous forces jewelry components are subjected to when the jewelry moves as worn. So cast pieces tend to crumble and break when confronted with excess force, where fabricated pieces do not. The Bali Style is copied in all types of metal materials. You will easily find the same bead in sterling silver, pewter, brass and metalized plastic. They all look alike – it’s really hard to tell the differences. Seed beads sizes are listed as “11/0” or “6/0” and the like. These very loosely refer to how many beads per inch it would take, if you lined a particular size up against a ruler. Thus, “11/0” means that there are 11 beads per inch. “6/0″ means that there are six per the inch. Thus, the smaller the size-number, the larger the size of the bead. An amulet purse that is 2″ x 2 1/2” in size, would be 2*2 1/2*2 in area, or 10 square inches. (2 sides of 2×2.5 inches). 10 square inches would use, for example, 2850 delica beads (15 grams). When a product is labeled “LEAD FREE”, it means that it complies with current state, federal and/or international laws regarding how much lead is permissible to leach out from a product. The label does not mean that the product has no lead content. This applies to pewter. It applies to other metals. It applies to glass crystal. Recently, California passed a much tougher “lead-free” standard than that of the US or international standards. Many previously “lead-free” pewter products have been disappearing from suppliers’ inventories, because they do not meet California’s new standard. There have not been many replacement products introduced since that law was passed. Flip Flops are a fashion statement — especially when decorated with bright, shiny Austrian crystal rhinestones. Unfortunately, the rhinestones will pop off easily, if the surface of the flip flops isn’t treated first. You see, the rubber flip flops are very oily, and glue will not stick to them very long. I suggest going to your local hardware store. Buy a can of wood-deck water-proofing sealant, and paint it on your flip flops. Let them dry. Then glue your rhinestones on. I suggest using a glue like E6000 or Beacon 527. Search engines require “words” and “patterns of words” in order to evaluate your site, rate it and rank it. So, that means you need a lot of words on your home page. It may not look as pretty as some Flash Graphics, but words are important nonetheless. I’d suggest writing three paragraphs of 3-4 sentences each. You can bury this at the bottom of the page, if you don’t like the look of words on your home page. In the first sentence of your first paragraph, use your major key words, but don’t repeat them in this paragraph. List your secondary set of important key words in your 2nd paragraph, but not your primary set as in the first paragraph. Again, don’t repeat them more than once. List your primary set of important key words in your 3rd paragraph, but this time as your last sentence in the paragraph. Again don’t repeat them more than once. The search engines are trying to figure out what is important, and what is spamming or gaming them. This approach works well. Start your home page with text, not images or tables. I like to put a catch phrase with some key words at the top of my home page, and each of my other web-pages. Text at the top leads to higher ranking than graphics, images or tables as the top line. Create a Title that is 9 words long. Put your more important key words first, and less than (but still important) key words last. The name of your business or your name are often NOT key words that you want your site indexed on by the various search engines. If this is the case, don’t use your name or the name of your business in the Title line. Don’t repeat any key word next to each other in your title list. If you are repeating a word, repeat it in a different form, like the “beads” and “beading” above. HAVE SOME HEAVY DUTY TARNISHING TO GET OFF? The easiest thing to do, to get off some heavy tarnishing off sterling silver, is to make a paste of baking soda and warm water, use a soft bristle toothbrush, and scrub and rinse. Even dry baking soda will take the tarnish off. Have a sterling teapot? — make a dip, instead of a paste. You don’t need to heat anything up. You don’t need a piece of tin foil. No magic, no hype, no huckster. By the way, you should never use a silver dip to clean your jewelry, or only use it in an emergency. Silver dips actually ruin your sterling silver jewelry. If you have to use a dip, go in and out and rinse. Not clean enough? Go in and out and rinse. Never leave your jewelry in the dip. Another great thing to have is a Sunshine Cloth. This has a chemical in it that eats the tarnish, but does not harm gemstones. Land of Odds sells this. As lot of jewelry stores sell this as well. I just learned of this website on a “beadingdaily blog”. I am very grateful for all the information. both on seting up a website and on glues etc. I need instructions on turning copper to a dark brown so it looks like copper sinks that you can buy. I can be reached on my cell at 615-389-3570. I was told this could be done with Liver of Sulphur. If so, do you sell it? Thank you for your inquiry to Land of Odds. Liver of Sulphur will work to turn copper darker. I sell this in the store, not online. But you can also use a hard boiled egg. Boil an egg and take off the shell. Put the silver in an enclosed space or plastic bag with the egg. If you are searching online, there are specific patina solutions used with copper to change it various colors. These I do not sell.